The function of the Royal Coat of Arms is to identify the person who is Head of State. In respect of the United Kingdom, the royal arms are borne only by the Sovereign. They are used in many ways in connection with the administration and government of the country, for instance on coins, in churches and on public buildings. Queen Elizabeth the First instructed that all churches should have a royal coat of arms to symbolise the fact that the monarch was the head of the Church of England. They are familiar to most people as they appear on the products and goods of Royal Warrant holders. "Hon Y Soit Qui Mal Y Pense"
"Shame to him who evil thinks." The Royal Coat of Arms of the United Kingdom have evolved over many years since the 1100's and reflect the history of the Monarchy and of the country, the arms have remained unchanged since Queen Victoria. 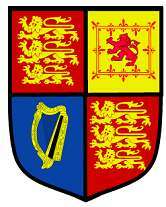 The shield shows the various royal emblems of different parts of the United Kingdom: the three lions of England in the first and fourth quarters, the lion of Scotland in the second and the harp of Ireland in the third. The shield is supported by the English lion and Scottish unicorn. The plant badges of the United Kingdom - rose, thistle and shamrock - are sometimes displayed beneath the shield.